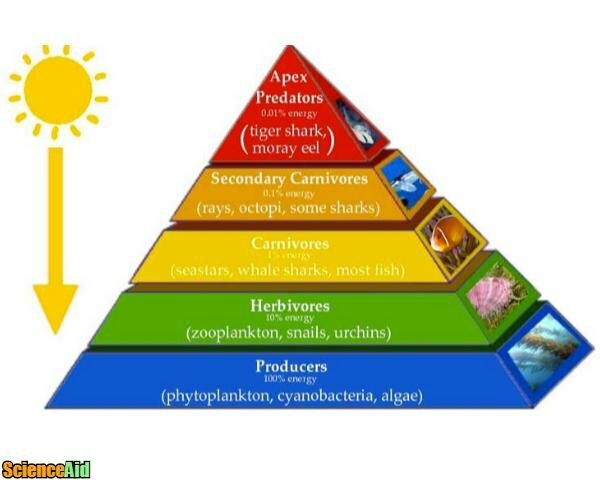 A trophic level is a categorized or hierarchical level in an ecosystem. Each trophic level includes organisms that work through the food chain to gain and lose differing levels of energy. 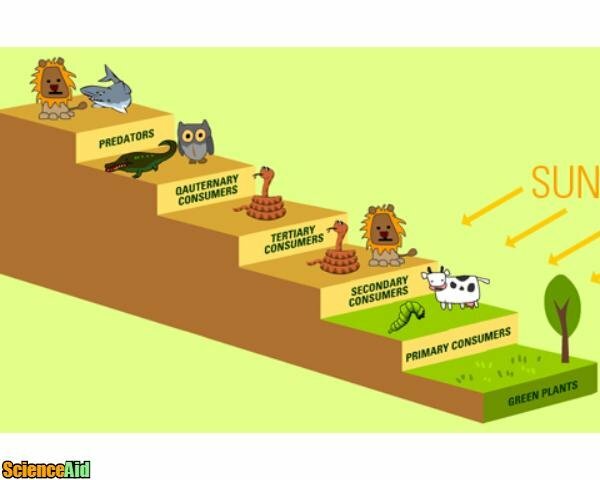 The food chain is a chain that identifies the energy relationship between different organisms. These are the first level in the pyramid and produce the most energy. These are plant-based organisms that convert energy from the sun through photosynthesis (grass, plants). These are the organisms that receive energy from the producers (insects, vegetarian organisms such as rabbits). These consumers receive energy from the secondary consumers (hawks). Some but not all food chain include a quaternary consumer, an organism that received energy from the tertiary consumers (bears, coyotes). To learn more about trophic levels, check out the ScienceAid article Food and Energy: Energy Transfer and Ecological Pyramids. This energy is converted into the tissues and will be transferred at the next trophic level. Using the rabbit example, the net consumer productivity is the energy transferred to the rabbit, converted into rabbit tissue (fat) that will be then eaten by the next consumer (fox). This is the energy the rabbit uses for metabolic processes including respiration, brain function, and to fuel the metabolic function of organs and tissues. Some percentage of the energy consumed will also be left as organic waste to be consumed by the decomposers. 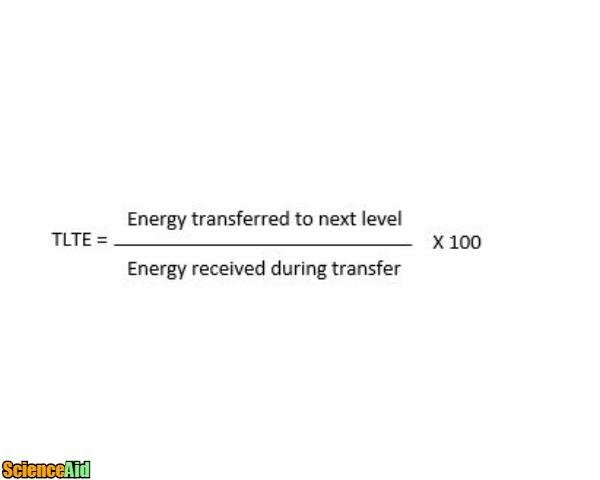 The energy received during energy transfer and the energy wasted can be shown through calculation. Energy is measured in kilocalories or Kcal. Foods that are low-energy have a smaller amount of Kcal than foods that are high energy. Scientifically, Kcal is measured by the ability of the energy to raise the temperature of water. So 1Kcal is able to raise the temperature of 1 gram of water by 1 degree Celsius. Energy is also measured in kilojoules (kJ), this unit of measurement is common in Australia. Calculating the energy transferred and Trophic Level Transfer Efficiency is important in order to identify the health of an ecosystem. Energy transfer calculations are also used to improve farming and livestock practices. MLA (Modern Language Association) "Calculating the Transfer of Energy Between Trophic Levels." 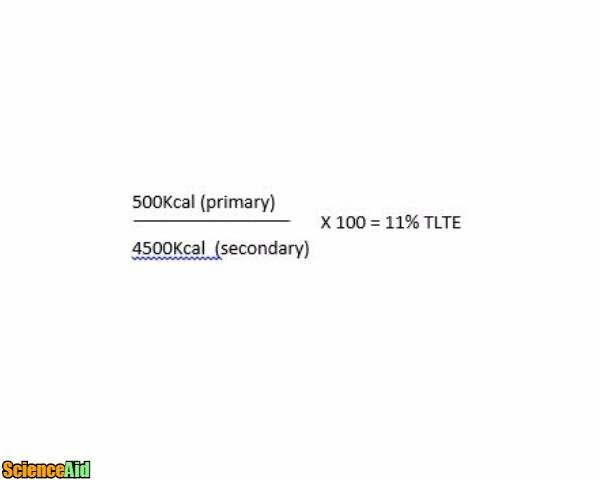 ScienceAid, scienceaid.net/Calculating_the_Transfer_of_Energy_Between_Trophic_Levels Accessed 23 Apr 2019. Chicago / Turabian ScienceAid.net. "Calculating the Transfer of Energy Between Trophic Levels." Accessed Apr 23, 2019. https://scienceaid.net/Calculating_the_Transfer_of_Energy_Between_Trophic_Levels. Thanks to all authors for creating a page that has been read 11,845 times.